With real-time bidding (RTB), impressions are bought and sold through open-market auctions that take place in the blink of an eye. It’s a win-win situation where advertisers can target the most relevant users, and publishers can maximize the efficiency of their inventory. Real-time bidding can be compared to a stock market, where the amount of demand at the moment determines the price of a stock. With real-time bidding, publishers set the floor price for an ad, but the demand still determines the final price. The whole process, from an app user triggering an ad request to the bidding process to the placement of the ad, happens in just 200 milliseconds. Is programmatic advertising different than real-time bidding? There is some overlap, but the words RTB and programmatic can’t be used interchangeably. Programmatic advertising is a form of purchasing ads that utilize technology to automate and streamline the process. However, programmatic advertising isn’t completely automated, as there needs to be a person to define the parameters of the advertising campaign, such as target audience, geographic area and desired ad format (video, native, display, etc.). However, once those parameters are defined, programmatic advertising streamlines the ad purchasing process through automation. The advertisers involved in RTB use programmatic advertising to improve the efficiency of their campaigns. 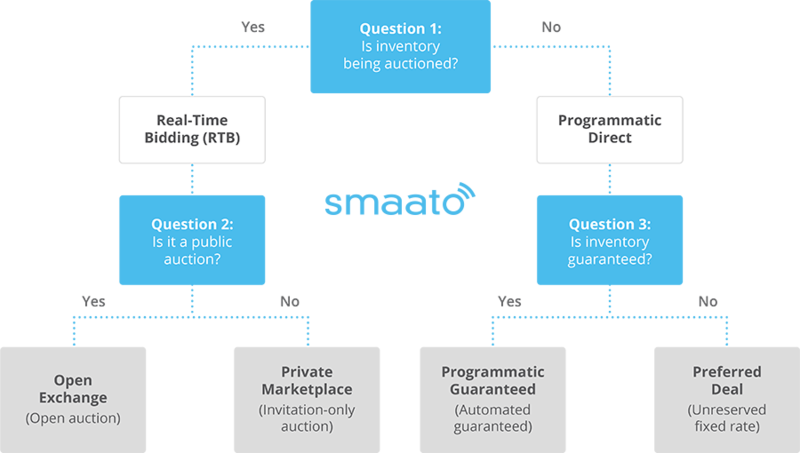 RTB is therefore programmatic by nature, as the bidding process is automated. The difference is that while RTB utilizes programmatic advertising, not all programmatic advertising uses RTB. For example, advertisers can programmatically purchase inventory directly from publishers instead of bidding on an open market with RTB. In short, RTB is always done through programmatic advertising, but programmatic advertising doesn’t always use RTB. When an ad is sold through an RTB exchange, there are three parties involved: the supply side, the demand side, and the exchange. These are the publishers. Within the app, publishers determine which ad formats and sizes to allow and then make these ad spaces available to bidders looking to have their ads placed. These are the advertisers, which can include agencies, demand-side platforms (DSPs), and ad networks. Essentially, they’re the ones who are looking to target a specific audience with advertising. Through programmatic advertising and an exchange, the advertisers can determine which users are the most valuable and then adjust bidding accordingly. An exchange, such as Smaato’s RTB Ad Exchange, makes the whole transaction possible. The Smaato Exchange connects more than 90,000 mobile publishers and app developers with 260 mobile demand-side platforms and 190 ad networks. 1A user triggers an ad request while using an app. Information about the user, available ad format, and other key factors are passed on to advertisers. 2Advertisers bid based on their interest and how the passed data measures up against their targeting parameters — the higher the demand, the higher the price. 3When a winning bid is determined, the ad is served to the user. The entire process takes 200 milliseconds. Smaato’s RTB Ad Exchange uses big data, intelligent algorithms, and state-of-the-art technology to enable publishers to maximize their revenues and advertisers to reach the most relevant users. This powerful solution helps both sides increase efficiency and achieve their goals. Why Is RTB Good for Publishers?